A game by Artur Games for PC, originally released in 2014. 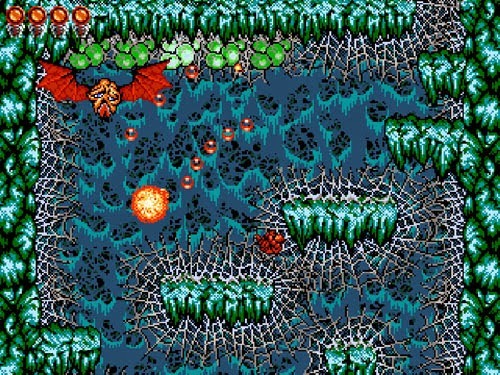 Super Cyborg is a run and gun shooter that summons the spirit of Contra to deliver an experience that is authentic to the NES original in almost every possible way, while also delivering its own unique flavor with insectoid enemies and grotesque boss creatures. 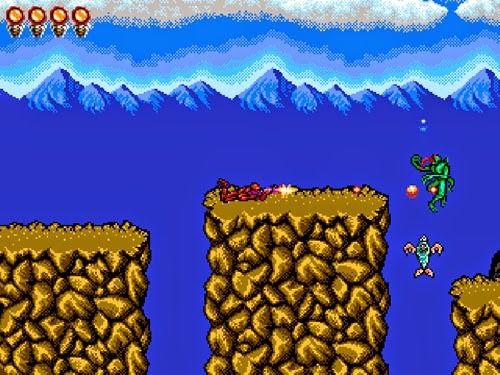 If the title screen had been preceded by Konami’s twin ribbons, players would have little difficulty accepting this as an official – yet slightly twisted – entry in the shirtless somersaulting soldier series. 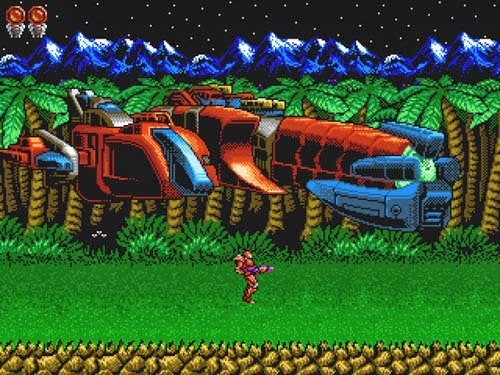 Upon booting the game, players are ushered toward the title screen with wailing synth over the developer’s logo, followed by the game’s logo crashing into view with a gleaming red cyborg soldier holding a shiny futuristic weapon. 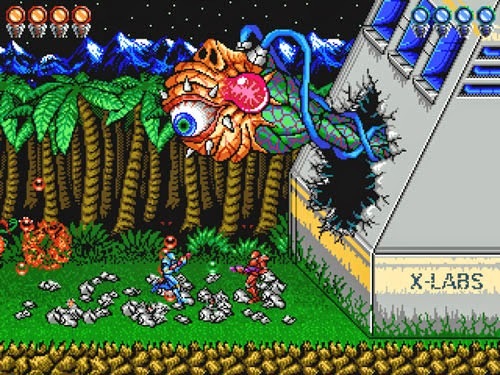 The cyborg theme is drawn from Contra’s European release (Artur Games is based in Russia) called Probotector, where human characters were replaced with robotic versions to bypass laws that prevented the sale of video games to minors that portrayed violence against people. So, instead of shirtless soldiers, the game featured armored bipedal robots, with player one represented by a red robot and player two represented by blue. 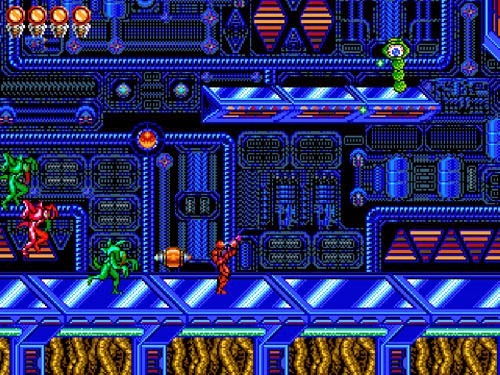 Similarly, Super Cyborg features local 2P co-op, with one red cyborg and one blue… and yes, you can steal your partner’s lives if you die before he does. The options menu allows players to set the game to run in 60 Hz to mirror the NTSC settings used in North America and Japan, or 50 Hz to mirror the PAL settings used in Europe. 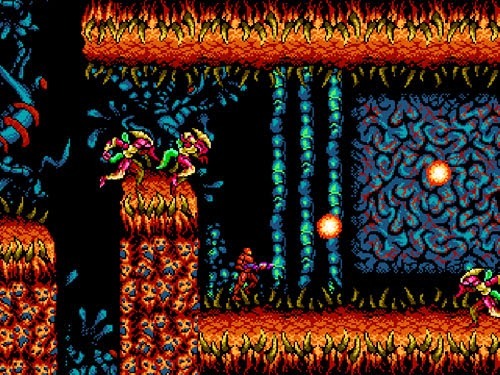 As was the case on the original consoles, running the game in 50 Hz causes gameplay to slow down somewhat, which can be used to the player’s advantage, though it is likely to feel sluggish to players who enjoyed the Contra series on NTSC systems. Another menu option gives players the ability to disable the smoothing filter, which is turned on by default to give the appearance of a game running on a standard definition CRT television. Turning off the filter renders everything with true pixel resolution and blocky edges. 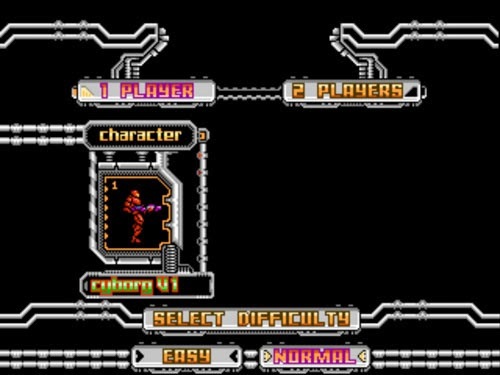 At the start of the game, players may select between two different cosmetic designs their cyborgs and begin the game on the Easy or Normal difficulty setting. A Hard mode is becomes available if you manage to beat the game in Normal mode… which is no simple task, as this game is every bit as challenging as its spiritual ancestor. 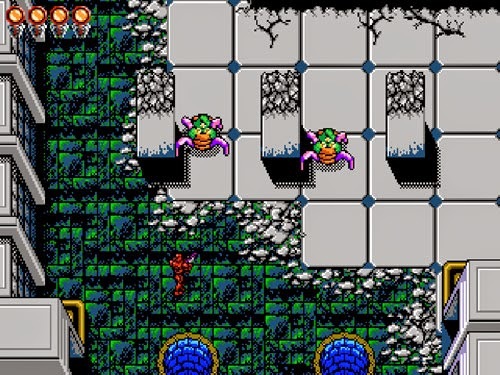 Players begin the game with four lives, with 1UPs granted at every 25,000 points (although the player’s score only appears between levels). This staring allotment is probably enough to see skilled players to the end of the first level in their early attempts, but not much further. Players will need to become familiar with enemy placement and behaviors in order to stretch those four lives to their limit. Players may wish to take a run at the game on the Easy setting (which is still quite challenging) to get familiar with the game before making a go on Normal mode. 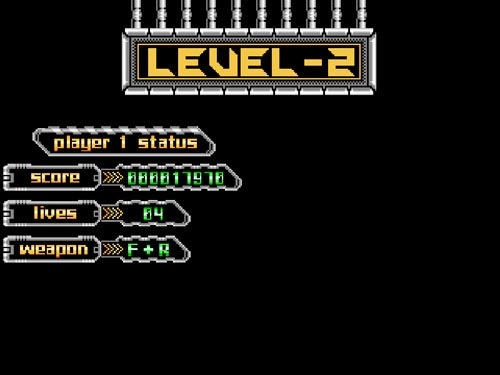 Losing all four lives returns the player to the start of the level. Fortunately, players have unlimited continues and may resume their progress from the title screen on future attempts, picking up from the start of the most recent chapter with their life count intact. 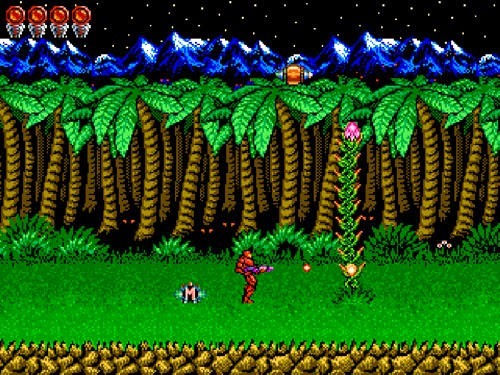 Player movement is very much in the vein of traditional Contra titles, with soldiers that have high spinning jumps and are able to aim in eight directions (aiming downward only while jumping). 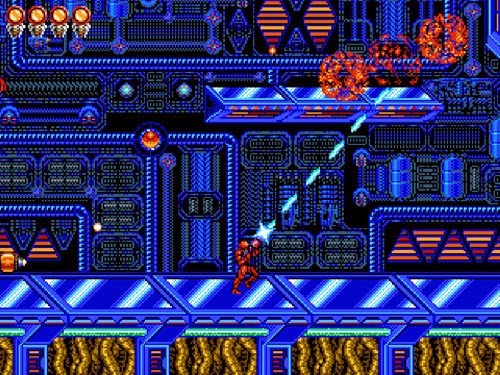 The player retains full control over his movement in midair, allowing him to dodge enemies and bullets, as well as line up platform landings. Pressing DOWN causes the soldier to lie flat on his belly and locks his aim to the left or right. 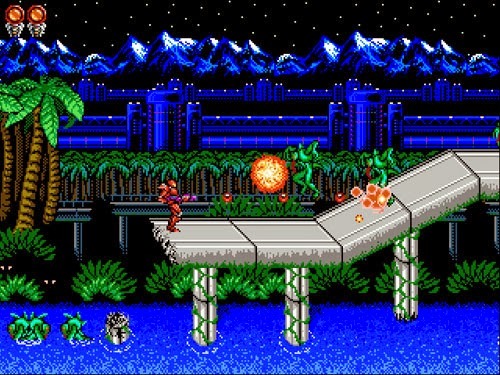 Pressing DOWN and JUMP causes the soldier to jump (as opposed to Contra where this action could be used to drop down through 1-way platforms). Getting killed causes the soldier to flip around and land on his back, just as in the Contra series, and respawning places him on the nearest safe platform with a substantial invincibility period. Anyone who has experienced the Contra series will be immediately familiar with the weapon system here. Weapon pods scroll quickly across the screen, moving in a wave pattern, and shooting the pods causes a letter to fall down to the ground. 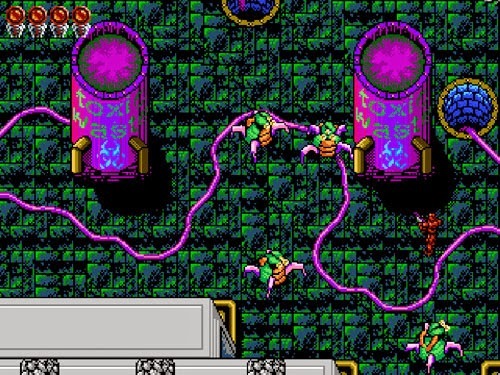 Some levels also feature metal walls that open to reveal turrets, or walls of energy that can be shot to dispense a weapon, just as in the first level of Contra. There are two main differences between the weapons found here and those in Contra. First off, all weapons are on auto-fire, instead of just the machine gun. Secondly, every weapon may be charged to unleash a powerful blast. Each weapon has its own charge effect, and the charge speed is quite high for the basic effect on most weapons, with the power growing higher the longer the weapon is charged. The high enemy spawn rate makes this secondary fire option difficult to use on the run, but it’s very effective against large slow-moving enemies, minibosses, and bosses. You begin each level and each respawn with a pellet-chucker that fires quickly with a narrow spray of weak bullets. Charging the weapon allows the player to unleash a wider blast that does more damage. The machine gun, represented by the (M) icon, has larger projectiles and fires more quickly than the default gun. The charged shot delivers a wide blast with a spinning cluster of bullets that increases in power the longer the weapon is charged. 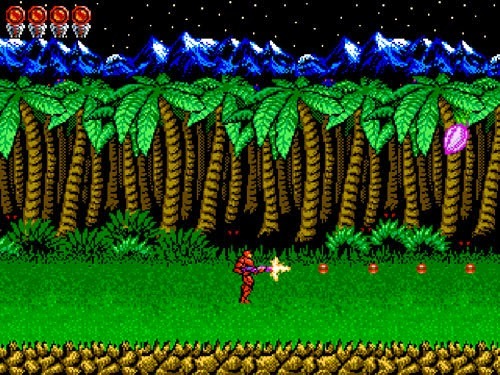 The flame gun, represented by the (F) icon, is much more useful than its slow-swirling Contra counterpart. This weapon fires off powerful fireballs in a straight line that explode on contact with enemies or objects, giving off a 4-way spray of splash damage. Charging this weapon unleashes a stronger version of the projectile with a 4-, 6-, or 8-way blast, depending on the length of the charge. The player-favorite spread gun is represented by the (S) icon and allows the player to fire off five bullets that spread slowly outward. Charging this weapon allows the player to unleash a wide concentration of colored particles that cuts through enemies. The laser, represented by the (L) icon, has low fire rate and narrow projectile, making it difficult to use against distant enemies that are placed above or below the player. However, the projectiles are long and very powerful, making them very useful for delivering concentrated firepower. Charging the weapon unleashes a powerful twin wave shot with a much wider path of destruction. The (R) icon represents rapid fire, and it is not a standalone weapon, but rather a modifier. Grabbing this icon increases the firing rate of any of your other weapons, including your default pea shooter, allowing you to unleash a ton of damage in very little time. This powerup also lets you charge your weapon more quickly. The (B) icon represents “bullet defensive armor”, which is another way of saying that it grants you temporary invincibility. 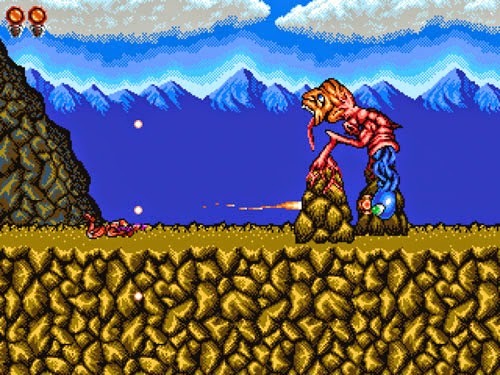 While in effect, the player sprite flashes and he is not impacted by weapons of any kind (although you can still fall into a bottomless pit), and any enemy touched is instantly destroyed. Lastly, there is the bomb, which is represented by a circle icon (O), and grabbing it destroys all enemies and projectiles onscreen at the time. Levels are generally straightforward, with a slow left-to-right march across the area and a boss fight at the end of each, with the occasional miniboss thrown in for good measure. 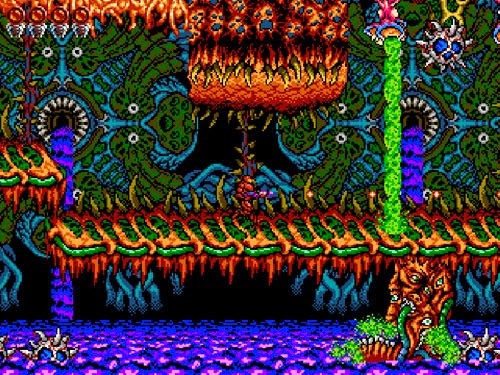 The boss at the end of the first level is a twist on the traditional first level base boss found in the bulk of the Contra series. But instead of blowing up turrets and picking apart the base, a mutant beastie breaks through the wall, extending outward on some kind of throbbing eye stalk surrounded by blue tubes. Setting the tone for the grotesque mutated creatures you’ll be facing for the rest of the game, this creature has a nose on the top of its head and a spike-lined eyeball that occasionally opens to reveal a toothed maw. 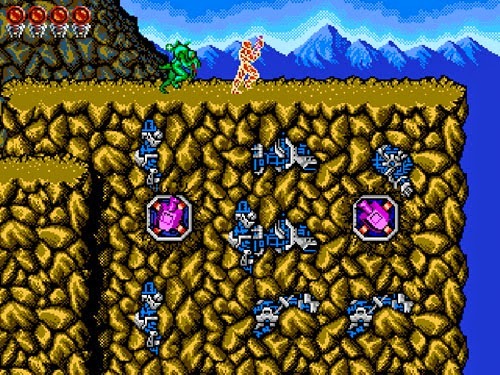 Defeating the boss pauses the action while a brief fanfare plays, and the soldier runs to the right and jumps into the hole to enter the base. 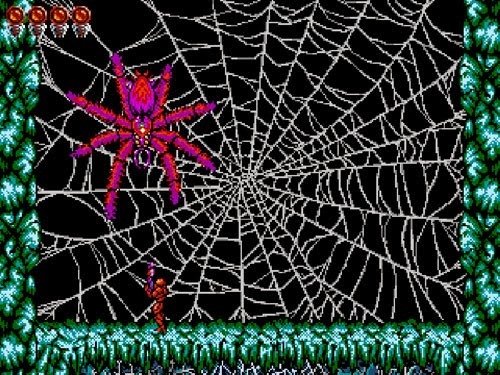 Where Contra’s enemies borrowed heavily from H.R. Geiger’s creature designs popularized by the Alien series, Super Cyborg instead leans more toward mutant and insectoid designs. One particularly disgusting miniboss battle takes place against a creature that has wrapped itself around a pair of rocks that it uses for legs. Its head has a long tongue that just hangs out of it, and it occasionally craps out some sort of blue protrusion that fires projectiles at you before it gets sucked back up into the creature’s body. 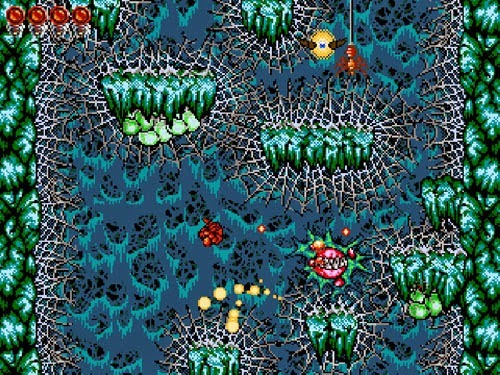 Levels alternate between indoor and outdoor environments, and – in a nice touch – the last screen of each level has a transition graphic showing the next environment, such as spider webs appearing at the end of level three to indicate that you will be travelling into an insect-laden cave and eventually facing off against a giant spider. While most levels are entirely linear, level five offers a branching path, with one branch leading to an optional miniboss encounter with a creature that drags itself along the floor of a tunnel, inching its way ever closer to you. Eventually, the two paths converge, leading you to the end level boss. 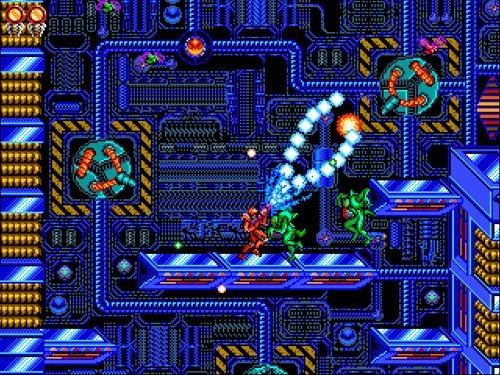 Contra games traditionally feature a couple of levels that change up the perspective, and Super Cyborg follows suit, although not until late in the game. Level six takes place entirely from an overhead perspective and offers slower and more deliberate action than the rest of the game. 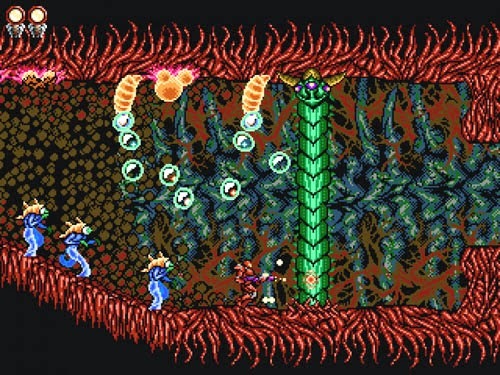 Players are free to take their time, as – unlike many of the sidescrolling levels – there are no infinitely-spawning enemies. Avoiding enemy fire is easier with the overhead perspective, and players are able to aim their weapons in eight directions. Standing in place allows players to hold their weapons in a chosen direction, offering more tactical options. 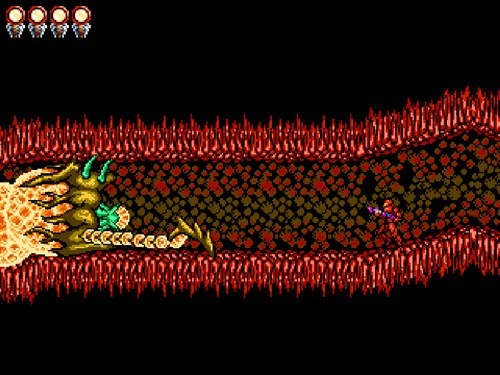 The level is quite lengthy, following a winding linear path leading to a boss battle. 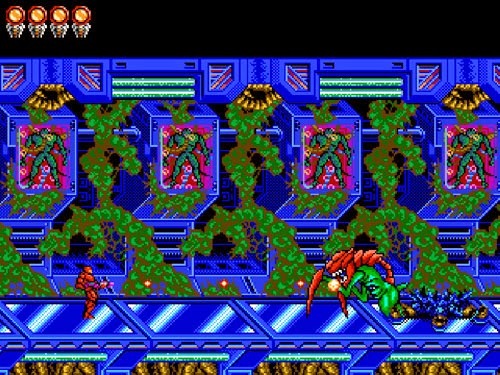 The level features turrets on rails, flying swarms of explosive enemies, slow-moving mutant creatures, and vats of toxic waste. The seventh and final level returns the action to the traditional side-view perspective for one last super challenging run through a hideous organic world, culminating in a very challenging final boss encounter. However, the game does offer one concession in the form of a pre-boss checkpoint that lets you hop back in for another go after you are slaughtered by the terrible monstrosity that awaits you. 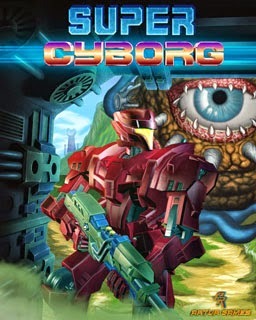 Super Cyborg was developed by Russia-based developer Artur Games.